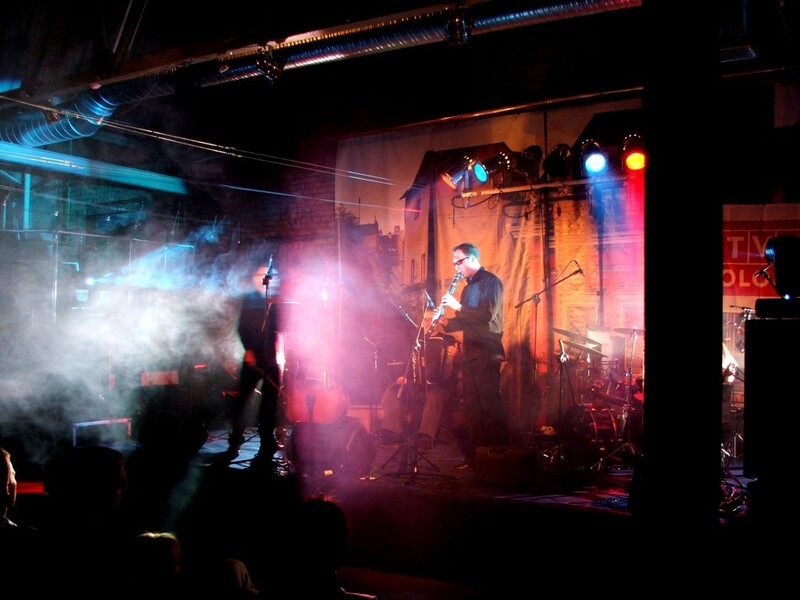 The Jewish district of Kazimierz in Krakow has long been the home of the city’s traditional klezmer scene. Duncan Rhodes meets the Polish musicians who are breathing new life into old wedding songs. In my mind I am a fresh-faced 19-year-old, full of the joy of youth, dancing and making merry at a village festival somewhere on the Polish-Ukrainian border. Colourful floats pass under branches decorated with ribbons, butterflies skit through the air and dappled sunlight kisses the cheeks of all the pretty Jewish girls in the procession, one of whom – the one smiling at me – bears an uncanny resemblance to Natalie Portman. In reality my 30-something posterior is parked in a deserted restaurant in Kazimierz, sheltering from the icy winds and rains of a fiendishly early winter, as I listen to the concert of a three-piece band called Di Galitzyaner Klezmorim. So hypnotic is their music, so conducive to flights of fancy, that it takes the slap of a cold draught on my face to wrench my mind from its romantic adventures in the shtetls of Jonathan Safran Foer’s Everything is Illuminated and reunite it with my body in 21st century Poland. Here in the present, amidst the rickety furniture and candelabras of Arka Noego restaurant, I watch intently as the band’s double-bassist imperiously strums his strings with delicate pale hands, his eyes shut fast in concentration. Next to him the accordionist’s fingers dance over an Othello board of black and white keys, his head nodding reverentially in time with the melody, whilst to his right the clarinettist sways supplely to the rhythm, her slender shadow dancing on the wall behind her. The joy of playing is evident, not only in the musicians’ faces, but the music itself which lilts, flourishes, rises, falls and swiftly changes tempo. It is playful yet sombre, full of bittersweet human emotions, a heartfelt and nostalgic paean to a lost age of innocence. This was during the mid-90s, when legendary klezmer artists such as Leopold Kozlowski (star of his own film The Last Klezmer) and Kroke regularly courted their muse in Kazimierz’s cafes, restaurants and synagogues. These artists inspired Di Galitzyaner Klezmorim to begin their own love affair with klezmer, a romance that has lasted eleven years and seen them play at concerts and festivals all over Europe. Their longevity is vindication enough of their skills, but I wondered if being Catholic Poles raised either obstacles, or eyebrows, in playing these traditional Jewish songs. Rafal responds with an analogy. Only a couple of nights later and I find similar sentiments echoed by Jarek, the double bassist of another of Krakow’s home-grown klezmer bands, the Klezzmates. “For two or three years we tried to play only traditional [klezmer]. But four years ago we said: stop – we can’t play this music like Jewish people. And we had some ideas to make our own music. 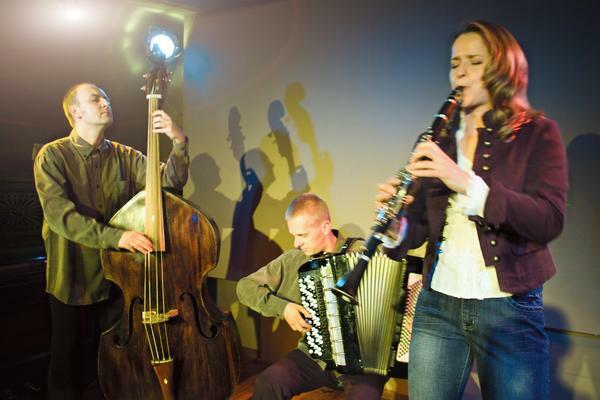 We wanted to take the most characteristic moments from klezmer music – rhythms, harmonies, melodies, scales – and try to make our own music based on these moments.” The result of this experiment is what Jarek and the rest of the band refer to as ‘New Klezmer’. Just across the road geographically speaking, The Klezzmates’ concert proves to be a world away in terms of atmosphere to Di Galitzyaner Klezmorim’s. Gone are flickering candlelight and old world romance of Arka Noego, to be replaced by the artificial lights and steel girders of the Galicia Museum. The hall is packed and I’m lucky to find a seat amidst the huge photos of crumbling synagogues and lichen-covered tombstones that comprise the museum’s main exhibit. As the Klezzmates take to the floor, dressed all-in-black with their signature red-tinted glasses, I find myself seized by many of the same emotions and flights of fancy evoked by Di Galitzyaner Klezmorim, except on a grander scale. I am no longer falling in love in the shtetls of Podolia but instead I find myself galloping over the plains of exotic Eastern lands, the protagonist in some swashbuckling epic – more Crouching Tiger Hidden Dragon than Fiddler on the Roof. (Natalie Portman however still plays a starring role). 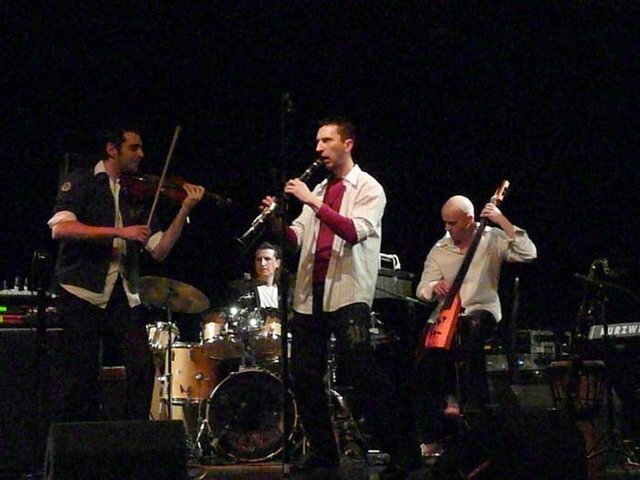 Just like Di Galitzyaner Klezmorim, the Klezzmates studied at Krakow’s Music Academy and similarly came into contact with klezmer whilst on their way to studies. They too are Polish, but take a more forthright stance on the Jewish question. After experiencing the classical arrangements of Di Galitzyaner Klezmorim and the jazzy improvisations of The Klezzmates, there’s one more band I am desperate to check out in Krakow – and they’re playing tonight. Hurrying across the inky ebb of the river Wisla, I leave Kazimierz behind and enter Podgorze, the district in which the Nazis created the infamous Krakow ghetto. Given the area’s past, it seems an incongruous location for a joyous Jewish folk concert, but tonight’s event – taking place in a hip riverside café – refuses to be shackled by the atrocities of history. Of all the bands I’ve heard it’s immediately obvious that Max Klezmer is the one which has strayed furthest from its klezmer roots. Descending into the Drukarnia’s cavernous concert hall, my ears are assailed by a barrage of bongo drumming, and – far from a quaint Jewish jig – I feel like I’ve just arrived at a Brazilian street party in full flow. Accompanying the cacophony, the crowd of Cracovian hipsters are enthusiastically clapping and whooping and spurring the band on to greater feats of uproariousness. Shortly afterwards the bongos are sidelined and an accordion and a brass section materialise, but, despite the return to more traditional instruments, a mood of zany exuberance prevails. Unlike my previous experiences of klezmer, the music’s visceral punch obliterates any opportunity for introspection. Instead my feet start tapping, my pulse races and my adrenalin rises as I’m caught up in the moment of the performance. The concert’s fun factor peaks during the encore as the band return to the stage one at a time sporting increasingly preposterous wigs – the first an 80s glam-rock mop, the second a bright red perm, the third a bilious green one, before finally the drummer emerges in a monstrous Saxon-blonde weave with braided pigtails in the style of a fearsome Viking warrior – or possibly a German beer wench. As the band launch into a rapturously-received finale there can be no doubt that, in this small corner of Krakow, an unfashionable Jewish folk genre is getting a much-needed makeover. And the crowd go wild for… klezmer! Szeroka Street in Kazimierz was the centre of Jewish life in Krakow pre-WWII. Today is it full of Jewish-themed restaurants, such as Arka Noega and Ariel and your best chance to catch klezmer ad hoc. Otherwise keep your eyes out for posters around town for top acts like Kroke (Steven Spielberg is a fan after seeing them play whilst filming Schindler’s List in Krakow) and Ira & The Klezmers. 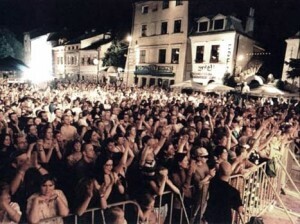 Events are sometimes organised in the district’s synagogues, and of course the annual Jewish Festival will bring international klezmer acts to every corner of Kazimierz in summer.